Differences in spring conditions forced by elevation were captured by photographer Roddy Addington from Powell Valley Overlook on May 3, as dark greenery of late spring amid the lower Valley gave way to early spring conditions above the great band of calcareous cliffs ringing the High Knob high country. One of the truly wondrous aspects of the High Knob Landform is that it possesses both size and elevation ranges necessary for a grand display of large differences in seasonal transitions. 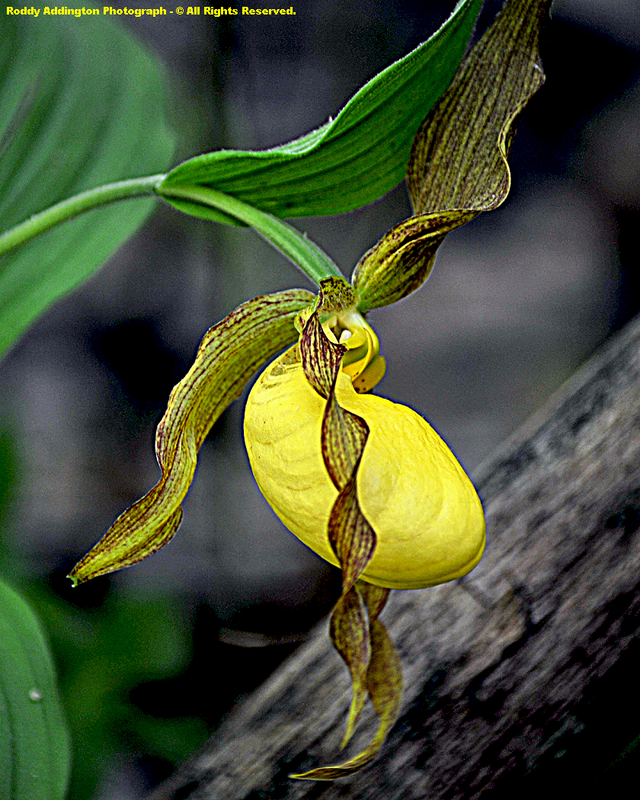 "In spring the mountain dresses from the bottom up. 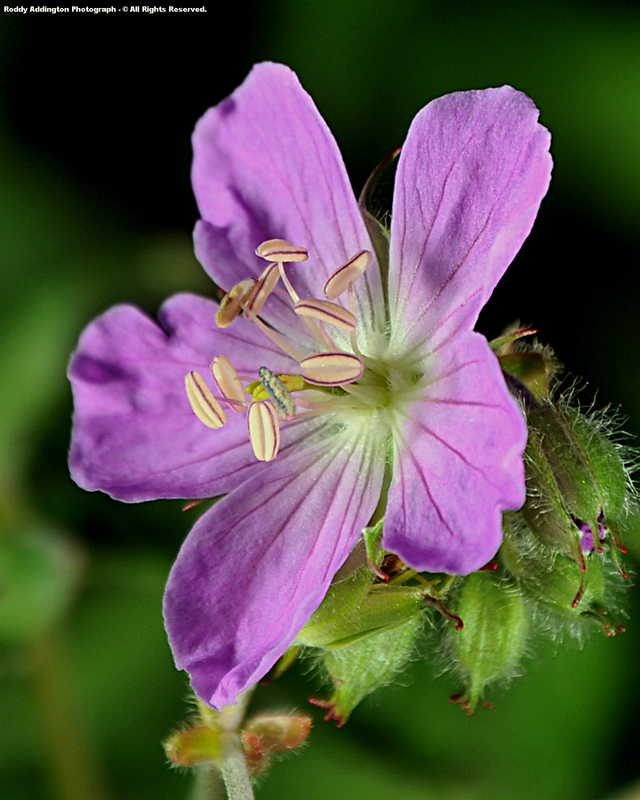 The green begins outside our window; the maples in the field above show pink. The green slowly creeps up the slopes and when it leaps over the cliffs, our spirits soar with it.........for then Spring has truly arrived, and if the Wood Thrush ( Hylocichla mustelina ) is not already on the hill behind the barn, she will not be far behind." Upon climbing upward into the great massif, conditions suggested from the photograph above become distinct and widespread above 3000 feet. Without a Lookout Tower it is not possible to truly illustrate the extent of conditions amid the high country, but an opening along a power line supplying High Knob Lake Recreation Area shows early spring conditions, with both bare trees and colorful maples! 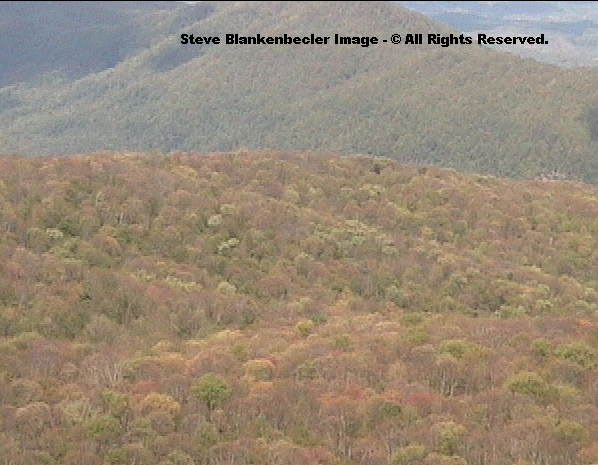 Conditions visible up close, between High Knob and Eagle Knob, show that most trees are just now beginning to leaf out as some remain bare. 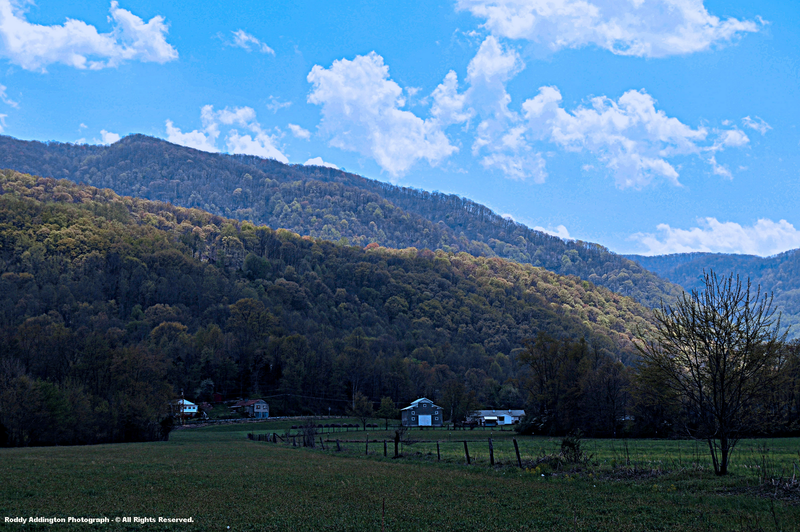 Its like stepping back in time to what conditions were like a month or so ago in lower elevations, and has always been one of my favorite aspects of spring amid the southern Appalachians. Current conditions in upper elevations of the High Knob Massif, as of May 6-7, are at a spring emergence point analogous to early-mid April within Powell Valley ( i.e., some 3 to 4 weeks ago ). 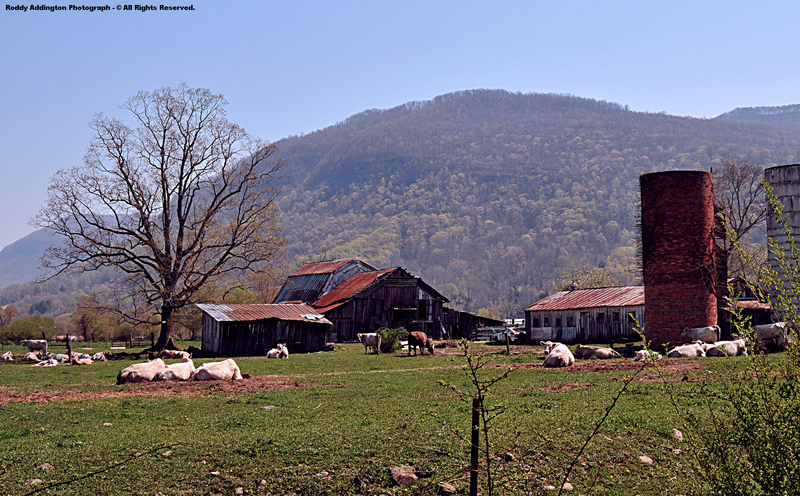 Early Spring In The Valley. GREEN-UP in Valley after recent flash flooding. 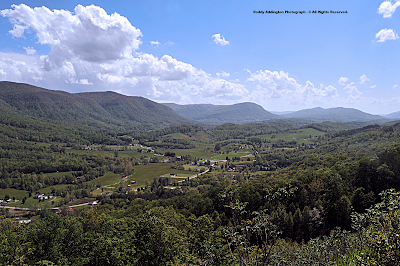 Surrounded by high country the Valley typically "greens" some 2 to 4 weeks earlier than upper elevations of the High Knob Massif ( generally above 2700 feet ). 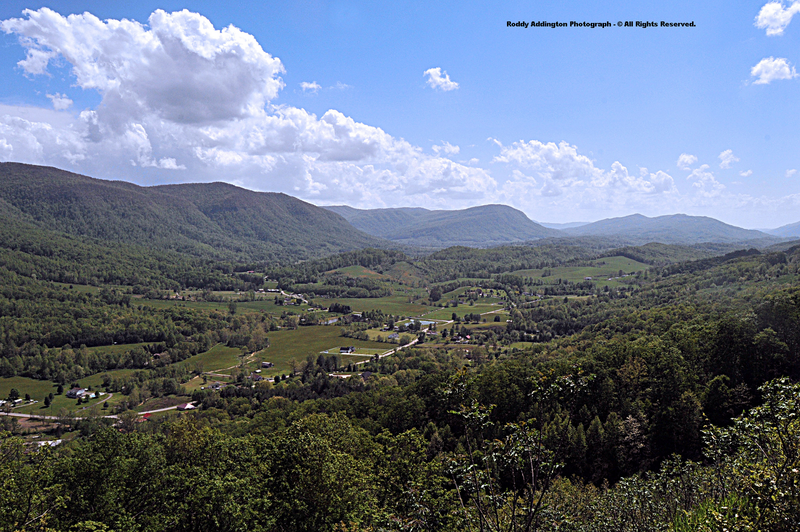 of the Clinch River Valley in northern Scott County, Va., can be greater, but photographs are not readily available to illustrate them ( i.e., outside of the outstanding documentation my friend, photographer & naturalist Richard Kretz is doing within The Pinnacle NAP of the Clinch Valley in Russell County, Virginia ). 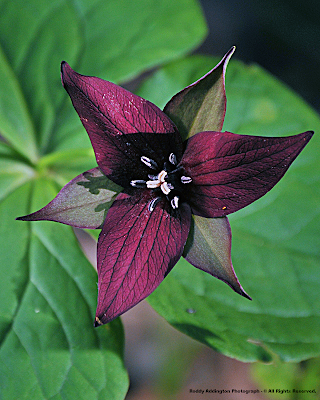 Furrowed Wakerobin, also called Mountain Red Trillium, was in bloom below 3700 feet elevation on the chilly, wet, northern slopes of the High Knob Massif during May 6. 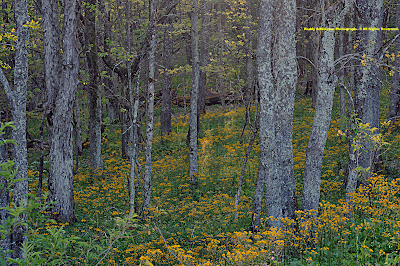 The large vertical elevation range ( and large size from SW to NE ) of the High Knob Landform provides an opportunity to catch multiple peaks in flowering, with different species unique to upper elevations being observed along with later bloomers common in the lower terrain. 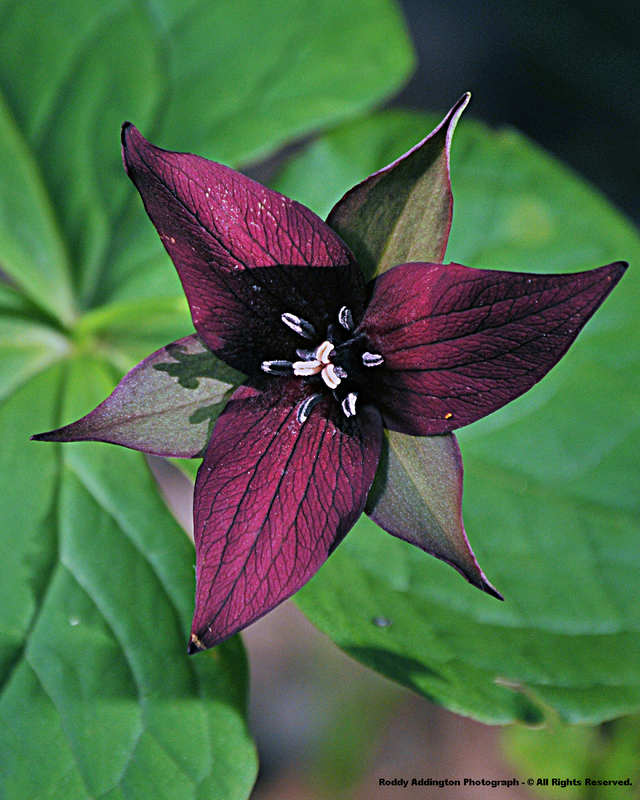 A single yet such beautiful example of multiple peaks in flowering can be illustrated by the simply wonderful Large-flowered Trillium, which is just now reaching peak bloom in the High Knob Massif. 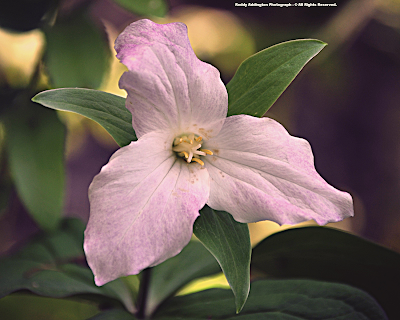 Large-flowered Trilliums typically change into various shades of pink with age, and I consider them at peak when there is about an equal mix of bright white & pinkish trilliums in a family cluster. My friend & photographer Roddy Addington estimated that he easily observed more than 1000 trilliums in glorious bloom during a Mother's Day journey along part of the High Knob Massif. 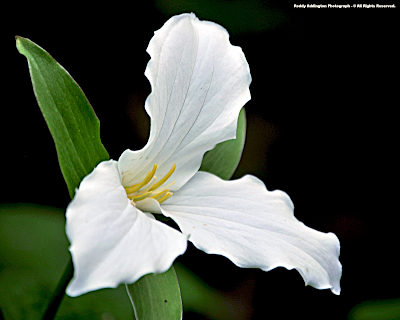 By contrast, as noted, my friend & naturalist Richard Kretz photographed Large-flowered Trilliums in peak bloom within The Pinnacle NAP of the Clinch Valley on April 10. Cooler days amid higher elevations and chilly nights within the highcountry basins contribute to slower spring emergence despite the much wetter conditions and abundant moisture for growth. Differences between the foothills adjacent to the High Knob Landform were highlighted last month, and can again be illustrated by a summary of mean April conditions. 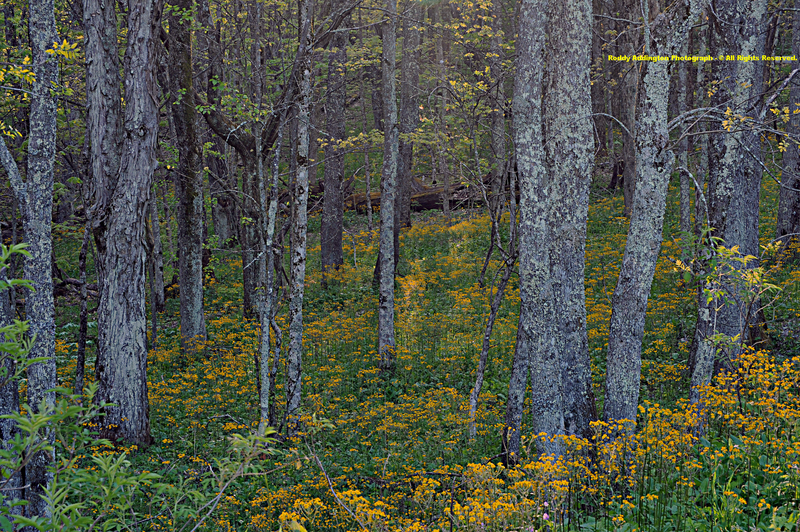 In the High Knob high country April 2010 temps varied from 60s by day to low-mid 30s by night within the colder mountain basins. Implications of the above are as previously noted during April, and as can be seen visually within all these wonderful photographs! the Kentucky side ( not visible ) being greener. 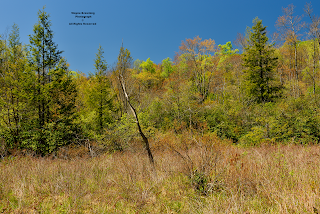 Even amid higher terrain along the VA-KY border, conditions in the Pound Gap section of Pine Mountain during mid-April were at an emergence point analogous to the current state above 2700 feet in the High Knob highcountry. My friend Steve Blankenbecler submits a image to further illustrate that conditions are still a long way from reaching summer maturity within High Knob Lake Basin, at elevations above 3500 feet. 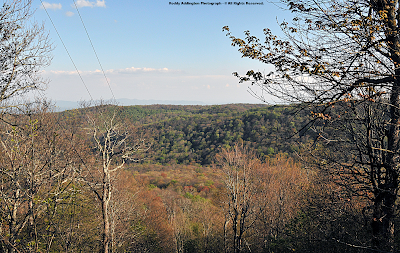 Even northern slopes of the High Knob Massif between 3000 and 3500 feet elevation have a way to go, as the above image illustrates well, before they green up to look like Pine Mountain ( below ). 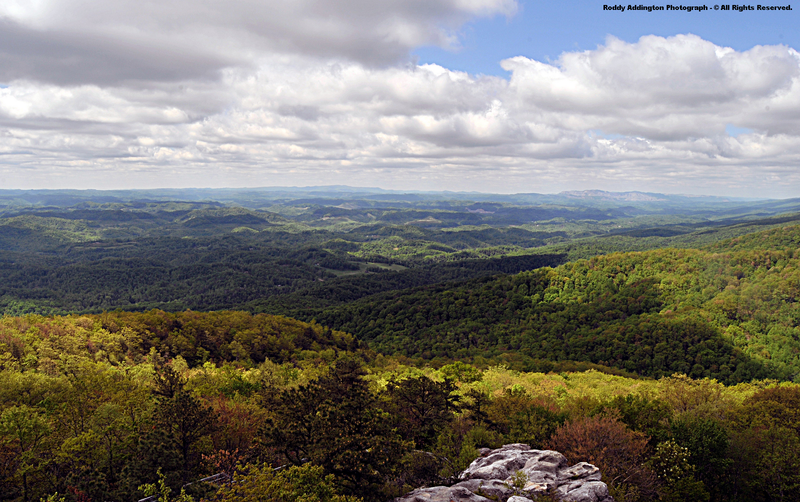 Birch Knob of Pine Mountain is the highest peak in Dickenson County, Va., with a summit elevation of 3149 feet above sea level. 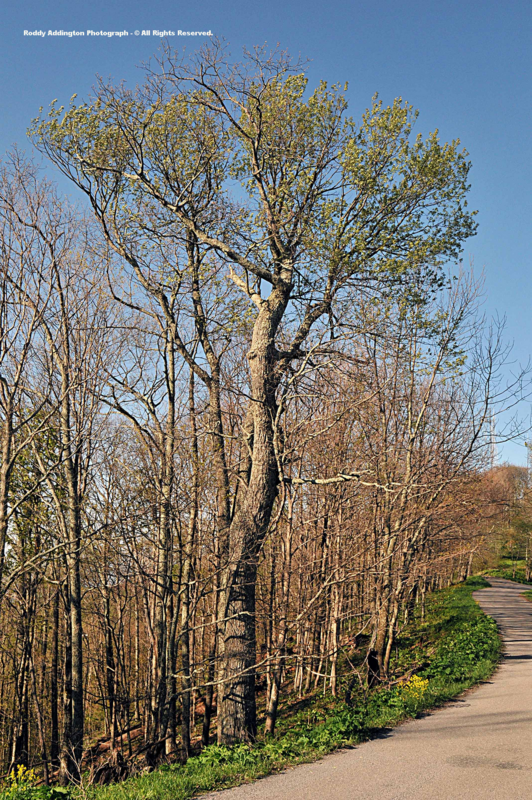 Although all trees have leafed out, it will be a little longer before those along the crest reach summer maturity. 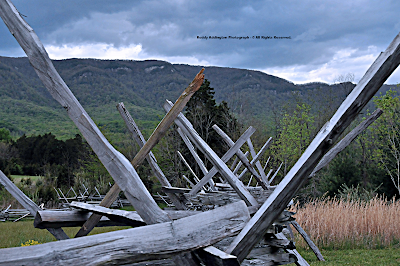 Capping the entire middle horizon of this photograph is a portion of the High Knob Massif with its long, rising swell of high country extending outward to join the jagged, undulating crestline of its northwestern mountain arm ( called Little Stone Mountain ). of the heavily strip mined Black Mountains. 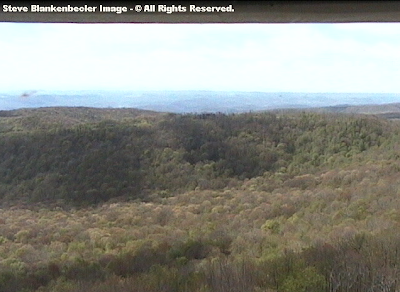 Cold conditions will slow growth observed in the above images, with upper 20s occurring at the summit level of the High Knob Massif during Mother's Day morning ( generating 6+ hours of below freezing conditions and LOWER wind chills on May 9, 2010! ). 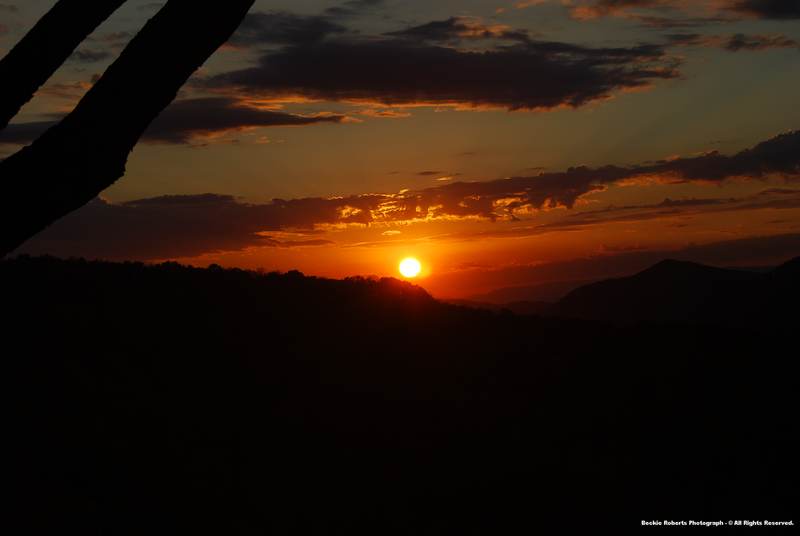 Even colder temps developed into the predawn hours of May 10 with a combination of light winds and unseasonably low ( dry ) dewpoint air over upper elevations supporting it's subsequent drainage into higher mountain valleys. Frosty upper 20s to lower 30s were common in mountain valleys at 4 a.m., Monday, as readings continued to drop! 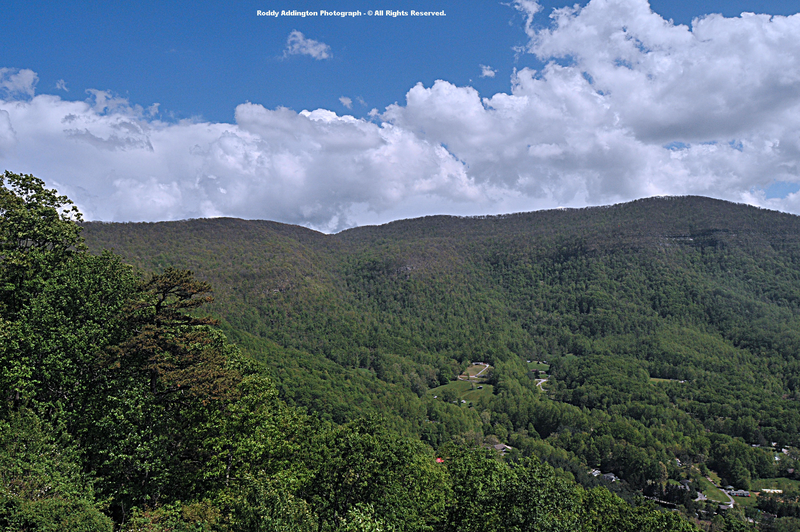 By contrast, temps along the mountain ridges were in the mid-upper 30s. ( the coldest 24 to 28 degree MINS occurring in lofty high country basins of the massif resting at 2400 to 3600 feet above sea level ). Spring Heats Up: Temps & Nature! This generated a hard freeze with 4-10 hours of sub-freezing conditions depending upon the locale. of their site locations ). 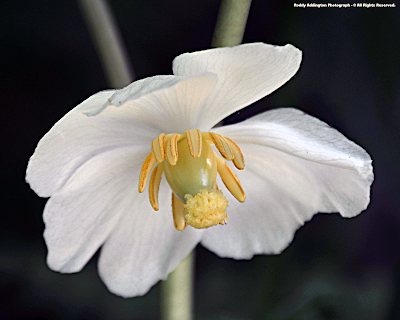 Occasionally, as noted below, there are extreme events in which even the most hardy suffer freeze damage! 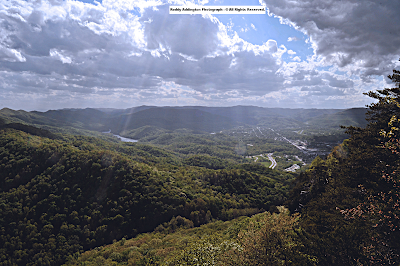 Valleys in lower elevations, below 1500 feet, were generally above freezing within the surrounding region ( far southwestern Virginia & southeastern Kentucky ). ( the lowest May temps being mid-upper 20s ). Mean nightly lows during the first half of May, in higher mountain valleys within and adjacent to the High Knob Massif, have generally been as cool or cooler than those observed amid the Kentucky foothills during the previous month of April. 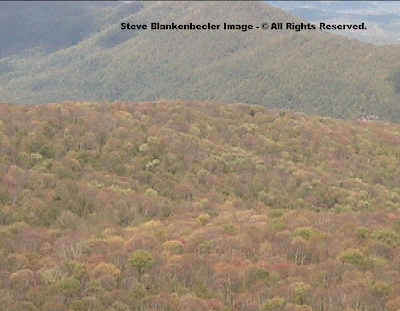 The above being another excellent example of why there are such large differences in spring green up across the area, with Mother Nature over time setting the biological clock of the highcountry backwards to in effect state, "if you come out too early, you will be frozen!" Lingering freeze damage from a historic May 2002 cold wave was still visible during early summer within the High Knob Lake Basin, as noted above, and was widespread in drainages of the much larger Big Cherry Basin. It can still get cold during May, especially if there is a rare snow. Such was the case on May 6-7 in 1989, when 2" to 4"+ stuck from Clintwood to Norton, Wise, and across the High Knob Massif. "The snow, which intensified around dawn, made early morning on May 7 look like a mid-winter blizzard. 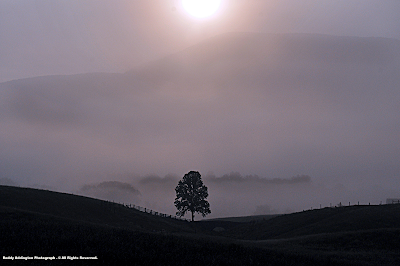 The mountains & hollows greeted dawn in an unsurpassed display of eloquent beauty! Adhesive snow crystals intermingled with a spectrum of hues representative of the early spring forest to create a silhouette filled with such majesty that even the Creator himself must have paused to ponder the magnificence of it all." More often than not, however, May coldness is not associated with snowfall but late season surges of unseasonably cold, dry air masses from Canada. ( * ) - Came in wake of 3.3" of snowfall. The coldest temperatures officially recorded on the Wise Plateau, at around 2550 feet above sea level, are applicable to exposed middle elevation locations of Wise & Dickenson counties. The coldest official temperatures recorded in Burkes Garden, at an elevation of 3300 feet, are applicable to the colder upper elevation mountain basins ( providing an idea of what conditions may have been like amid the lofty basins of the High Knob high country during past years prior to any temperature recording in the massif ). Standing out in the Burkes Garden data set are great May cold waves during 1925 and 1947. 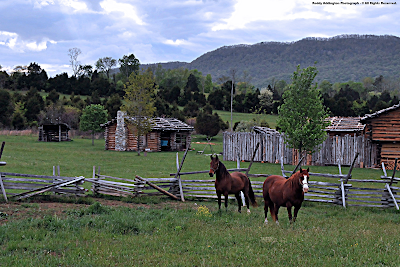 "Temperatures plunged into the upper 30s in Wise prior to dawn on May 18, and held there into mid afternoon as a historically long period of record breaking cold settled into the Appalachians. The unusally long-lived period of cold temperatures damaged gardens, orchards and vegetation as record low temperatures were set by both day and night. 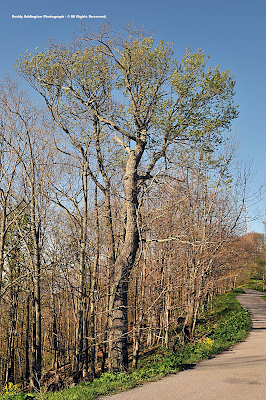 In fact, freeze damage browned so many trees that some places looked more like autumn than late spring! Minimum readings amid the colder mountain drainges reached the lower to middle 20s during the period. 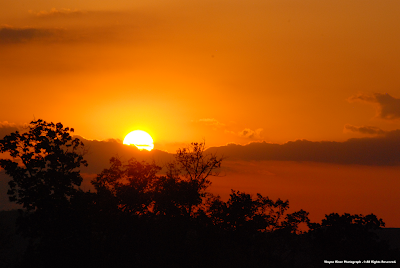 All total, seven new low temperature records were set in Wise during the five day period!" The most severe hitting May freeze of recent note, and historic impact, turned mountain forests of the High Knob Massif into a blaze of brown and black during May 2005 ( especially below 3500 feet, where the most trees had leafed out ). "The most widespread and extensive freeze damage in local memory," is how the May 2005 event was described after long time residents like Addison & Elizabeth Stallard ( in Powell Valley ) and Otis & Nancy Ward ( in Robinson Knob ) verified that it was truly of historic nature. 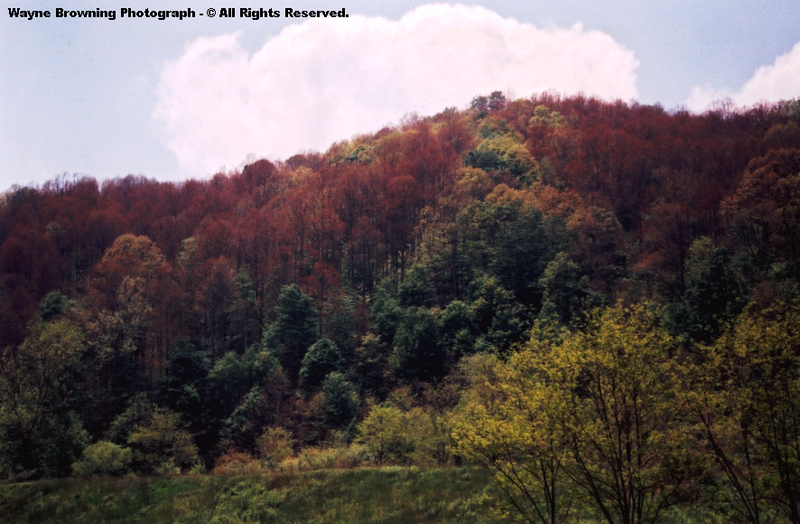 Mountain forests across the High Knob Massif did not recover from its impact until late June and early July 2005 ( widespread brown trees making late spring and early summer look more like autumn following color fade. An incredible sight like nothing I had ever seen in my life! ). *A Golden Rule: The first night following a cold frontal passage is typically colder upon mountain ridges and exposed plateaus, while the second night becomes colder within adjacent mountain valleys. Although not always the case, of course, it is more often than not a golden rule that holds true. **Other chilly May nights within colder mountain basins of the High Knob Massif included upper 30s to lower 40s on May 5, and middle 30s-lower 40s on May 7 ( during 2010 ). 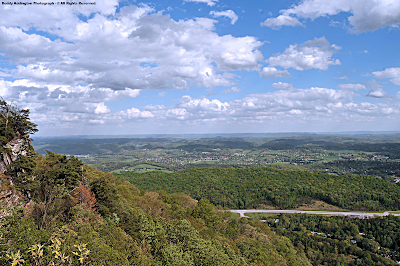 The large size of the High Knob Landform ( HKL ) also allows latitude to play some role in speeding spring green-up toward the southwestern end of the HKL ( from near the VA-TN border to I-75 ). Majestic Fern Lake and the Middlesboro Basin sit some 2300 vertical feet lower in elevation than the High Knob Lake Basin, such that elevation is the major player. 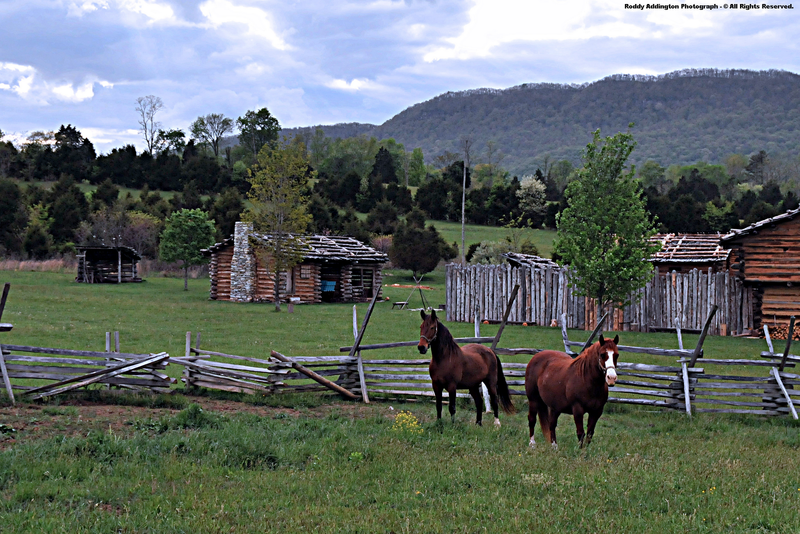 Latitude also plays some role, since this part of Cumberland Gap NHP rests 64 air miles SW of its remnant massif ( i.e., the High Knob high country ). The water level of Norris Lake, Tn., at 1020 feet, lies 3203 vertical feet lower than the peak of High Knob. 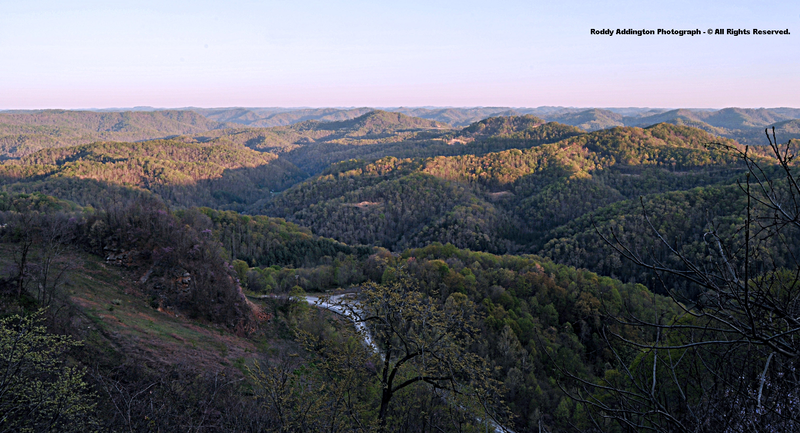 This southwestern most extent of the HKL is more than 108 air miles southwest of Guest River Gorge, at its northeastern end in Virginia. The lofty backbone of great Cumberland Gap NHP, with its dual Cumberland-Brush Mountain confluence, creates a rugged and truly gorgeous backdrop for Wilderness Road State Park, and also possesses enough elevation range to accentuate seasonal differences within the vertical. 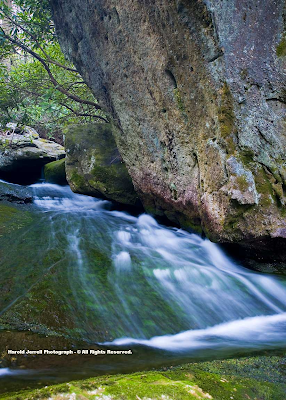 Although much more narrow than the sprawling High Knob highcountry, and lower in elevation, the high terrain spreading outward at the confluence of Cumberland and Brush mountain's gives birth to what are likely the two most pristine whitewater creeks in all of Kentucky. 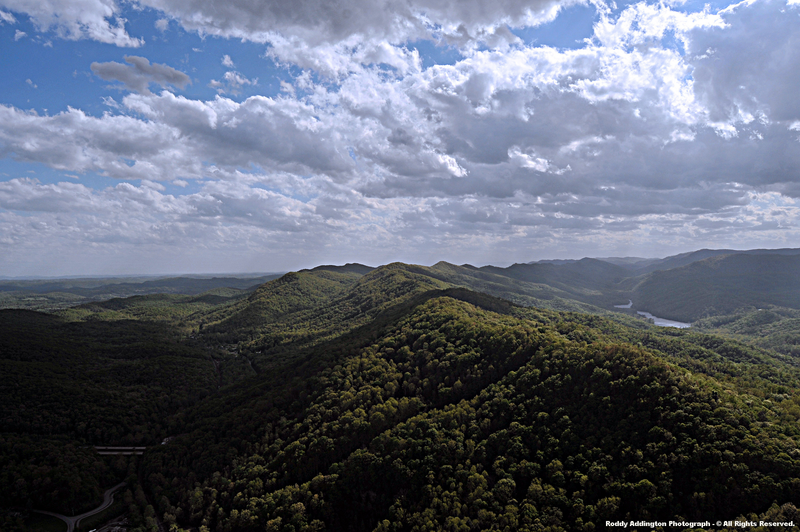 Martin's Fork ( a state designated Wild River ) and Shillalah Creek, which collectively drain a large area of remote wilderness within & adjoining Cumberland Gap National Historical Park along this simply wonderful NW mountain arm of the HKL ( i.e., the geological NW flank of the Powell Valley Anticline ). 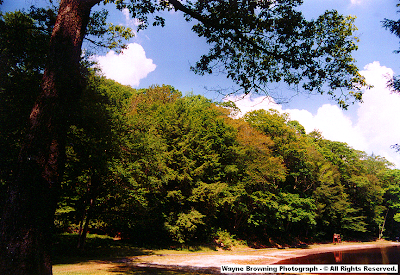 ( spring ) and summer-winter ( autumn ). Although the above differences have been unconsciously known and taken for granted over the years, this is the first time that a website has documented them in such a visual way. 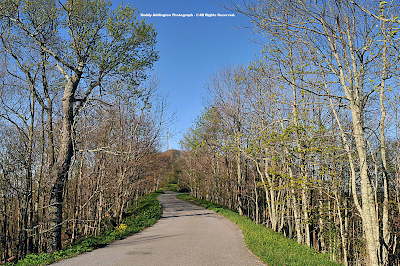 It is also, of course, the first time that a website has been created to specifically highlight and document the natural world of the great High Knob Landform. 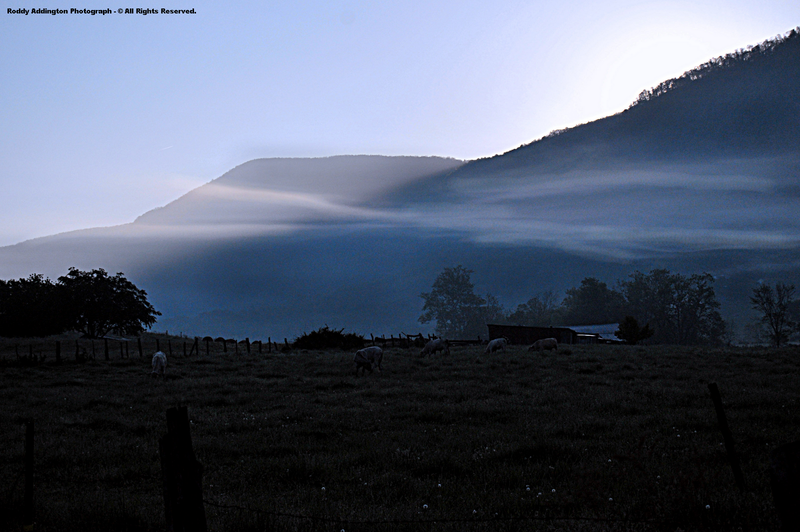 Unique mountain generated rolls & waves were captured by photographer Roddy Addington in the early morning light of May 7, as low-level moisture was forced to rise upward along nearly vertical walls of the High Knob Massif. What makes the above scene rather unique being that there were clear skies aloft, with the stacked rolls and waves developing as air near the surface cooled to its dewpoint to reveal previously invisible moisture. 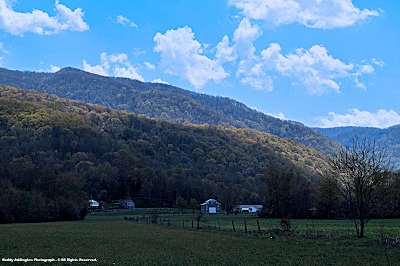 The morning featured a simply huge temperature contrast, with 35 to 45 degree readings in colder mountain valleys being in dramatic contrast to 50s and low 60s across mid-upper elevation ridges and plateaus exposed to SSE-SW winds. A nice way to open or close any HKL website update is by featuring the glory of our mountain sunrises & sunsets! Lets all say a big...WOW!